In February I wrote about how we use Mint to track our budget. It’s a wonder and free tool that allows you to quickly review your income and spending. It’s really useful for us when we do our monthly net worth reviews. What Mint does is grab your linked accounts’ data and create and organize useful data based on those transaction. Learn the Exact Amounts of Your Debt and Your Budget: Having the exact numbers can be powerful and eye-opening in some cases. Seeing how much debt in you’re in can motivate you to get rid of your high interest debt on the credit cards. Set Up a Payment Plan You Can Keep: You can compare your money habits in the past and see where your money leaks are so you can redirect that money to a debt snowball. 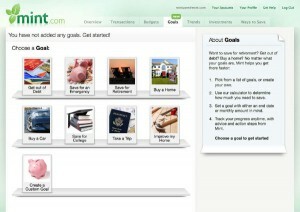 Mint’s goal feature helps you to see how quickly you can pay off your debts and how much money you’ll save. Stay Motivated and Reward Your Achievements: Staying motivated while paying down debt usually means celebrating milestones. Finding small rewards for your victories can keep you going. Mint can help you with the first 2, the last one is up with you :). Let me share how helpful Mint can be with tackling debt. For this post I want to highlight the first one – paying off credit card debt. 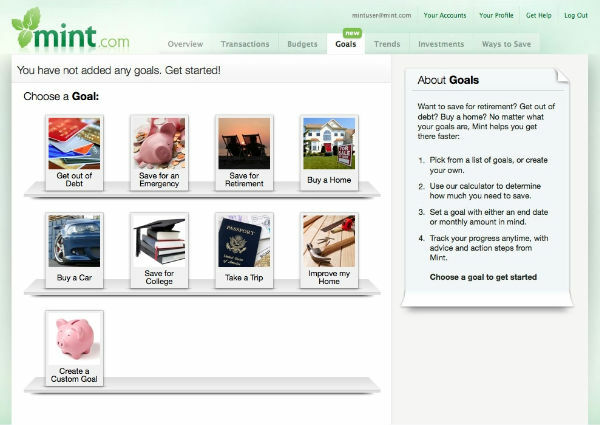 To use Mint’s goal tool, you simply select the goals tab and with the various options, you’ll find paying off debts. From there you’ll be guided to customizing your goals. For myself, I had to select which credit card I was tracking and give the interest rate information for my credit card. Mint is even able to track introductory interest rates, which is extremely helpful for those who may have large balance whose repayment will exceed the special intro offer. The next step is coming with a monthly payment plan and comparing the pros and cons of each. With Mint you can see how much you save on interest payments, which is a handy tool and a bit motivating to having a bigger debt snowball. Along with monthly emails to track your progress, you can also log-in at any time and see how you’re doing. mint can also share tips and offers from other credit cards that may give you better interest rates. How many of you already use Mint? Have you used their goal feature?